Display these convenient 5x7" signs in your dispensary, consultation rooms, waiting areas and reception desk. 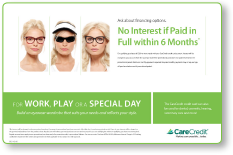 As you educate patients on the value of recommended lenses, show them how their total out-of-pocket investment can be broken down into convenient monthly payments. Not enrolled in CareCredit, call 866.853.8432 for more information or to get started today!